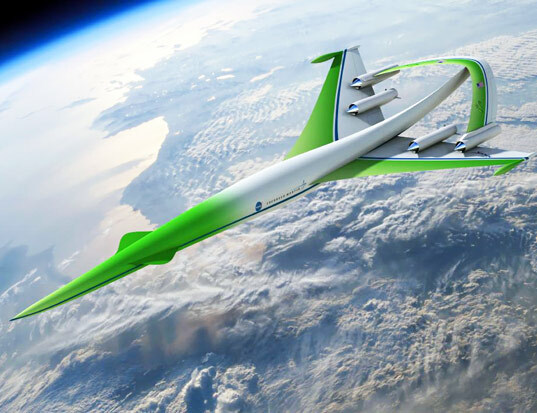 NASA and Lockheed Martin just unveiled a design for an ultra-efficient aircraft dubbed the Supersonic Green Machine. Though there’s not much known about the craft at this point in time, it could prove to revolutionize the air-transportation industry. The new plane will employ an inverted-V design in order to dramatically increase energy efficiency and decrease the noise created by a sonic boom — which is usually terrifyingly loud. This dream machine may just be the one that makes commercial supersonic air travel a possibility. One more ridiculous project, in order to syphon more taxpayer money and greenwash what is done in the real world. Please look at the high definition picture on the NASA website, and see that the reactor pods are so absurdely designed that there are not even bolts to tie them to the rest of the plane. It is more a student in CAO project than an actual flying machine project. NASA unveils the Supersonic Green Machine. NASA and Lockheed Martin just unveiled a design for an ultra-efficient aircraft dubbed the Supersonic Green Machine. Though there's not much known about the craft at this point in time, it could prove to revolutionize the air-transportation industry. The new plane will employ an inverted-V design in order to dramatically increase energy efficiency and decrease the noise created by a sonic boom -- which is usually terrifyingly loud. This dream machine may just be the one that makes commercial supersonic air travel a possibility.